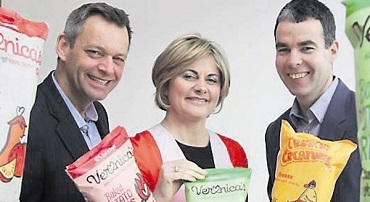 Cork-based food company, Veronica’s Snacks has landed a “game-changing” investment that will enable it to bring its range of wholesome treats to a host of new, health-conscious customers. The business, led by its founder Veronica Kenneally, secured a €465,000 equity investment from a range of investors led by AIB Seed Capital which is putting up €150,000. Enterprise Ireland; the Boole Investment Syndicate and chartered accountant, Brian McGann will provide the remaining €315,000 to the Ballincollig-based business, opening up a host of expansion opportunities. “The snacks and crisps category is continuing to expand in all our main markets, with healthier brands leading the way in the battle against the growing obesity problem. Thanks to this game-changing equity investment the Veronica’s Snack brand will be seen by more consumers, in more markets and across more sales channels than ever before,” said Ms Kenneally. Founded in 2012, Veronica’s Snacks distributes lower fat, gluten-free crisps under the ‘Veronica’s’ and ‘Crunchy Creatures’ brands and consequently opening up a new world of choice to retailers and customers alike. Totalling nearly half a million euro, the equity investment will enable the start-up to break into new markets and to launch further flavours in 2015. Since the summer of last year, the brand has been on sale in the UK, along with all major multiples in Ireland. The company is also developing new pack sizes and flavours for release in 2015 and is expanding the ‘Crunchy Creatures’ range to include more characters.